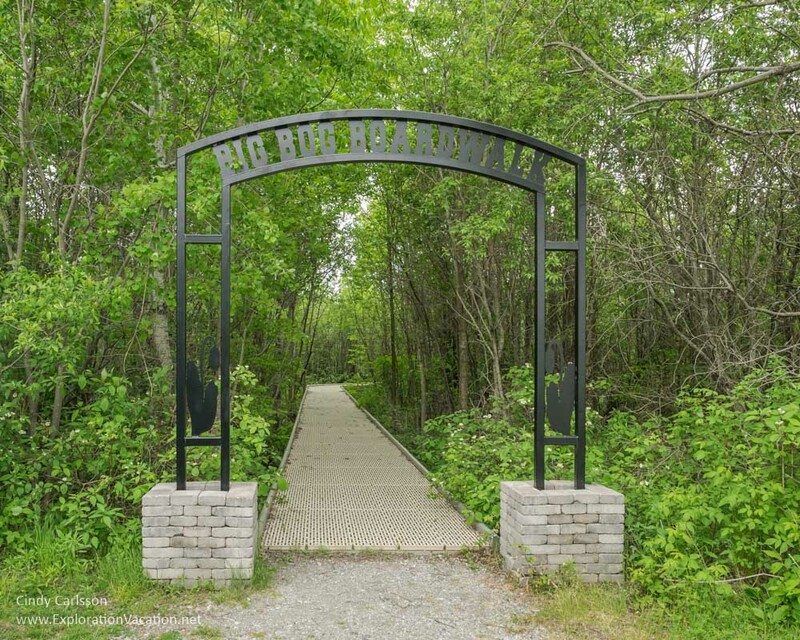 Minnesota’s Big Bog State Recreation Area is best known for the mile-long boardwalk that takes visitors into the odd world of the largest peat bog in the lower 48 states. 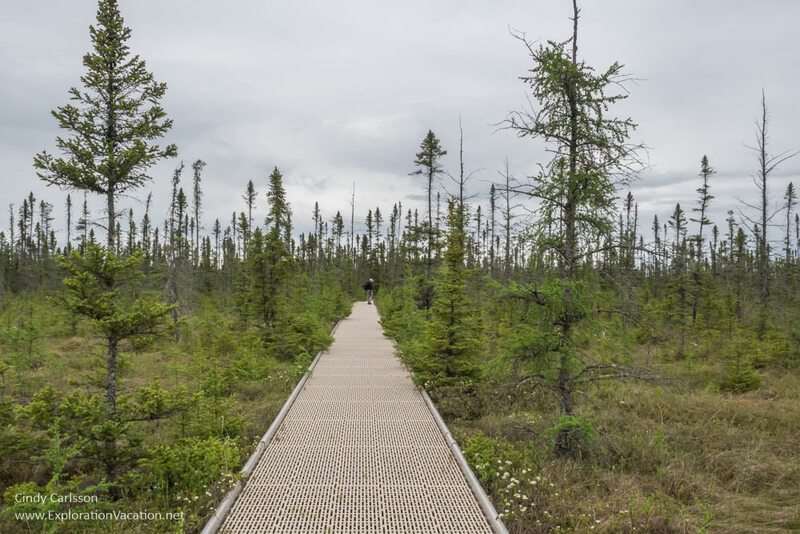 Expect to see carnivorous plants, native orchids, rare birds, and maybe even a moose as you follow the bog boardwalk into this strange world. Although generally referred to simply as the Big Bog, Minnesota’s Big Bog State Recreation Area is more formally known as the Red Lake Peatland. By any name, peatlands are a vast watery landscape of bogs, fens, upraised peat islands, and open water. While characterized by saturated soils, not all areas of a peat bog will have visible standing water. What they will have is lots of water-absorbing sphagnum moss and a unique plant community that includes native orchids and carnivorous pitcher plants. And it’s those plants that drew me here. A visit to Minnesota’s Big Bog begins on Ludlow Island. Visitors find a short trail around Ludlow Pond that wanders through a mix of conifers, deciduous trees, and shrubs not unlike those found in many areas across north central Minnesota. Along the way, the path circles a small pond. (While one would never know by looking at it, the pond is not natural – it was once a gravel pit!) But there are no islands in that pond, so where is Ludlow Island? It turns out that the woodland around the pond is the island. Ludlow Island is not surrounded not by flowing water, but by the vast peat bog. 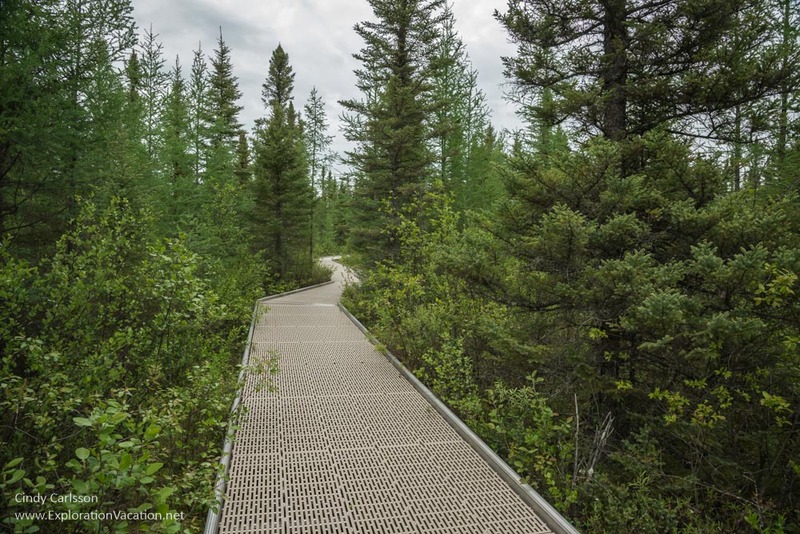 While most peat bogs are all but inaccessible, a small piece of Minnesota’s Big Bog can be easily visited by anyone thanks to a mile-long bog boardwalk. The Big Bog boardwalk begins in the sort of damp mixed forest that is common in this part of the state. Soon the deciduous trees are replaced by a forest of black spruce interspersed with tamarack (larch), balsam, and cedar. A shrubby undergrowth of leather-leaf fills the space between trees, with few hints of the sphagnum moss that forms the bog’s base. The landscape and plants around us keep changing as we walk. Sometimes we are deep in an evergreen forest, sometimes in more open woodlands with small meadows or swampy areas with standing water. As the forest begins to open, there are more tamarack and larger “meadows” of sphagnum moss, Labrador tea, cotton grass, and false Solomon’s-seal. Then, at last, the low trees give way to a grassy open landscape with just a few stunted black spruce trees. From a distance the landscape doesn’t look that different from the prairie where I was raised. However, closer inspection shows a very different plant community. 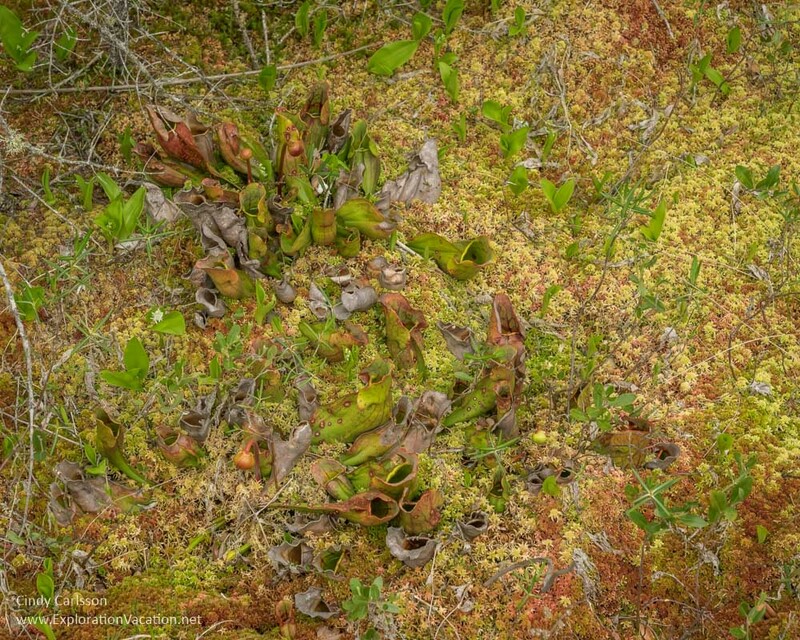 Besides the sphagnum moss, cotton grass, and false Solomon’s seal, there are other grassy-looking sedges (not just the cotton grass), brightly blooming bog laurel, and pitcher plants. It’s the purple pitcher plants (and the hope of seeing early-blooming orchids) that brought me here. However, the pitcher plants are so well camouflaged that at first I don’t even see them! Pitcher plants are extremely well-adapted to this wet, highly acidic environment. Peat bogs are low in nutrients. To compensate, pitcher plants are carnivorous – they “eat” insects that get trapped in the bowl of water they hold. It’s probably more accurate to say they dissolve insects, but the result is the same – the demise of said insects and additional nutrients for the plant. Minnesota’s Big Bog State Recreation Area includes the Upper Red Lake Peatland (a National Natural Landmark) and the Lost River Peatland Scientific and Natural Area (an Audubon Important Bird Area). The peat bogs protected in this park are just part of northern Minnesota’s Big Bog. Lake Bemidji State Park also has a (shorter) bog boardwalk (PDF). Both provide visitors with a look at the unusual plants that live in the bog. To the east, the Lost River Peatland Scientific and Natural Area is home to many species of rare bog plants. It’s one of a number of protected scientific and natural areas that offer a glimpse of the Big Bog. However, these are only suitable for scientists and true wilderness lovers, as none have visitor facilities or maintained trails. Special rules apply to visitors at all SNAs. The Big Bog recreation area is located along the eastern shore of Upper Red Lake in north-central Minnesota. This is a fairly isolated area just over an hour north of Bemidji and nearly two hours south of International Falls. It’s a five-hour drive from the Minneapolis/Saint Paul metropolitan area. The tiny town of Waskish is located just outside the park. Basic necessities and a restaurant are available here. As the name implies, the Big Bog State Recreation Area offers a range of recreational opportunities. The park is divided into two sections: The northern unit where the Big Bog boardwalk is located and the southern unit with the visitor center, fire tower, beach, campground, and other park facilities. The park’s northern unit is located on Ludlow Island, an upraised area in the Big Bog. The island has a couple of looped hiking trails, a historic site (I don’t know what it is because we didn’t get out there and there is no information on it on the web), a pond, and the access to the bog boardwalk. The Ludlow Pond Trail circles a little pond that was once a gravel pit. Today it is stocked with pan fish and Minnesota residents can fish here (and only here) without a license. Access to the bog boardwalk is on the far side of the pond almost directly opposite the parking area. The trail is short and well-maintained and fully accessible. Go either direction to reach the boardwalk. The boardwalk itself is also fully accessible, with a hard flat surface. It’s a one-way path, so one mile out and one mile back. But don’t turn around before getting to the end, as the very last part of the boardwalk is where the most interesting vegetation is found. If you need a break along the way, there are a number of benches and information signs. In general, early summer is the best time to visit to see bog plants in bloom. The pitcher plants were blooming when we visited in early June, but it was still too early to see either showy or yellow lady’s slipper orchids. The southern unit is located between Upper Red Lake and the Tamarack River, offering both a sandy beach along the lake and a lazy river for canoeing, kayaking, and fishing. We didn’t spend any time in the southern unit on this trip, but this is where the visitor center and fire tower are located. There are also a couple of historic sites and hiking trails with wildlife observation areas. Climb the historic 100 foot fire tower anytime the visitor center is open. For those that don’t make the climb, a camera at the top of the tower provides a view down to those on the ground. Swim in the lake. Because the swimming beach on Upper Red Lake is very shallow, it is a particularly good beach for children. Children will also enjoy the playground and athletic fields located just across the road from the state park. Go fishing. This is an excellent spot for fishing, with walleye hiding in both Upper Red Lake and the Tamarack River. There are even docks along the river where campers can tie up their boat. Paddle down the river. The visitor center rents a wide range of watercraft, including paddle boards, so there’s no reason not to be out on the water. Look for wildlife. While the caribou that once roamed the area are long gone, there are still a few moose, bear, and smaller mammals around. There may even be a cat or two, although seeing one is really unlikely. Of course there are also lots of birds, including a number of uncommon species. The campground is also located in the southern unit. The Big Bog State Recreation Area is open year-round. The visitor center rents canoes, kayaks, stand-up paddleboards, boats, and (in winter) snowshoes. There is also an interpretive exhibit and gift shop. Like all state parks, a Minnesota vehicle permit is required within the Big Bog recreation area. Permits are available for the day or year and can be purchased at the park. While this probably goes without saying, bring bug spray. While the bog itself wasn’t very buggy when we visited, the surrounding woods were. There is no food available in the park, but groceries and a restaurant are available in nearby Waskish. There aren’t many lodging options right around the Big Bog State Recreation Area. However, the park itself offers a campground with 31 camp sites, 26 of which have electric service. There are also six camper cabins with electric heat. These are available throughout the year. They don’t have plumbing, but the campground shower building is available during the camping season and a shower and restroom are available in the visitor center during the winter. There are at least two resorts near the park, West Wind (Trip Advisor affiliate link) and Beacon Harbor. There are, of course, many more options as you move farther from the park in almost any direction. Just be sure to match your search to your direction of travel as you check reviews and prices on Trip Advisor (affiliate link). Published by the DNR (but not linked to the park’s website), both the Red Lake Peatlands poster (pdf) and the Scientific and Natural Areas Patterned Peatlands page provide wonderful illustrated explanations of how peatlands form and function. There is also some information on plant communities. The SWS Wetlands of Distinction website has a page with mostly scientific information on the Red Lake Peatland, including links to other sites and the only plant list I found. The New York Times also has a nice piece about the Big Bog from 2008. Learn about the people who have called this area home for generations in Anton Treuer’s book, Warrior Nation: A History of the Red Lake Ojibwe. Early in the 20th century several counties went broke trying to drain the Big Bog to turn it into farmland for homesteaders. The Koochiching County website has some information on this part of the bog’s history. During the Cold War the Big Bog was used by the military to test bombs and other munitions. The Minnesota Conservation Volunteer covers some of this history. Minnesota’s Most Colorful Season Is Here! I don’t know much about plants but your post was truly enlightening, Cindy. You’ve even inspired me to add the Minnesota’s Big Bog State Recreation Area to my bucket list and see this beauty in live. Plus, your pictures left me speechless! Thank you for your kind words, Lydia. 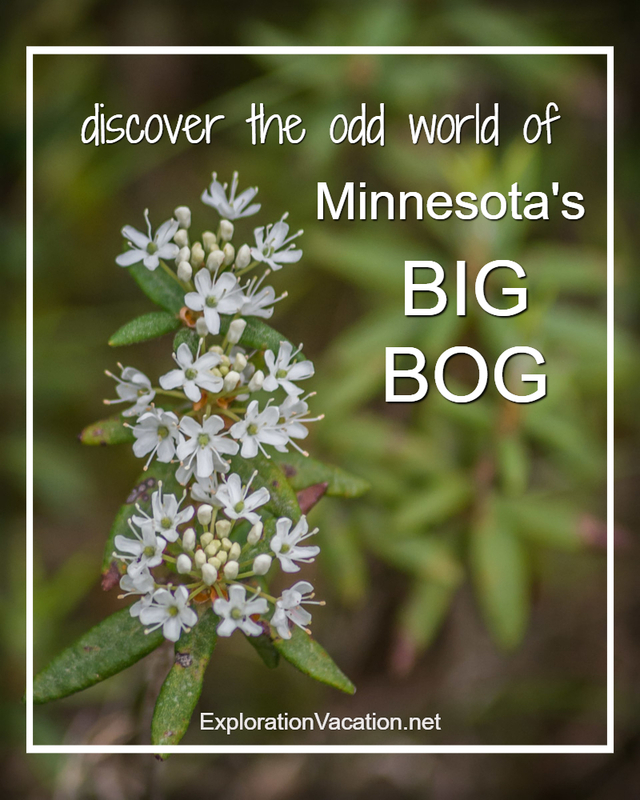 The Big Bog is a very cool place and it isn’t too far from the Headwaters of the Mississippi River, so you can add that to your travel list as well! Love that it’s called Big Bog! Those pitcher plants are really cool, and I’d be really excited about the prospect of seeing a moose, even though they scare me a little! I would expect you to be interested in those pitcher plants! While there are moose in the area, there aren’t very many so you aren’t very likely to actually see one. If you do see one, you’re right to be a little scared — they can be dangerous!